To elliminate the uncertainity of EC2 instances going down for unknown reasons leading loss of our data. To have almost unconstrained storage space. To have a robust system that can cope with application scaling. Ability to SSH to the MySQL machines. If you decide to use EC2 API CLI, it must be on your machine where you are running EC2 API commands from, and configured. There are two ways to do this. Use the one that looks less scary to you. Here -z is Availability Zone and -s is size of the volume in GiB. Please note that it's important to have the volume in same Availability Zone as the MySQL machine you are trying to attach to. 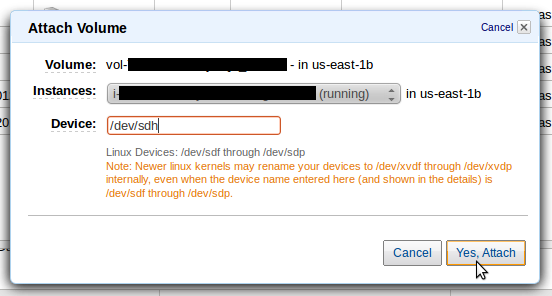 here -d is device name. It's not necessary to use /dev/sdf you may use /dev/sdh or anything else. You may, now, try creating a database and look into /vol/lib/mysql. Lets move to setting up replication. If you have a my.cnf file, back it up. We are going to edit it. This file is going to have details about master and slave. Also, lets find starting position of binary log. This information will be required to configure the slave. Edit or create slave machine /etc/my.cnf to have server-id, you may enable binary logging but not required. Now you may create/delete a database, a table, insert/remove data and see on slave machine happening the same. Installed MySQL on my EC2 instances. Created, attached, formatted, mounted a Volume to these machines. Added the details to fstab. Stopped MySQL. Moved MySQL data and log directories to the volume. Recreated placeholder directories in the same place as previous ones, and binded it to the new location. Added to fstab and mounted. Restarted MySQL and ran a sanity test. Stopped MySQL, and edited/created my.cnf on both machines to assign them a server-id and enable binary logging. Started MySQL. Created a replication user. Noted down master node's status. Connected slave with master using CHANGE MASTER ... command. ran START SLAVE command to start replication. Performed a sanity test.